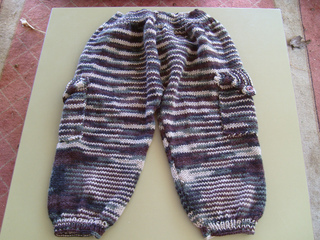 Pants have a crochet chain drawstring and pockets with buttoned flaps. 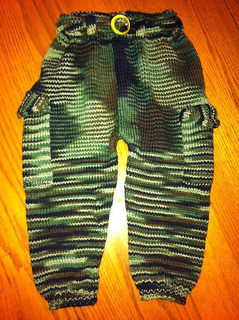 Note: Original yarn in pattern, Bernat Camouflage Ombres & Solids, has been discontinued. 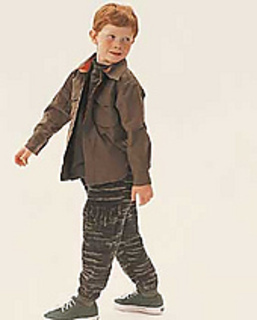 Substitute Bernat Super Value Ombres & Solids. Size 5 mm (U.S. 8) knitting needles and size 5 mm (U.S. 8) circular knitting needle 24 ins [60 cm] long or size needed to obtain gauge. Length of elastic 1½ ins [4 cm] wide. Size 5.5 mm (U.S. I or 9) crochet hook for drawstring. Note: Only adult sizes are provided in pdf downloads.